Have the ride of your life in a helicopter in Mallorca. There are different schedules and flight times, starting from Palma. Experience a bird’s-eye-view of Mallorca and get to see the island from a new perspective. This is the ideal wedding or birthday present for one of the big ones. This is by far the top way to see Mallorca. It's marvellous, mesmerising and memorable! Are you looking for an exceptional holiday in Mallorca? Do you think you have seen and done everything there is on offer already? Then, throw yourself into a different kind of adventure and dare yourself to go on an exciting flight over Mallorca! A helicopter flight in Mallorca introduces you to a unique world full of fascination, excitement and passion. Be a passenger on an adventurous flight over Mallorca and take part in one of the best things to do in Mallorca. Please provide your weight in the comments section. With this offer you can enjoy a spectacular scenic flight over Mallorca, where you will get to know the island in a whole new way. You will view angles of Mallorca that you did not know even existed. You are able to see the sights from up high and admire the untouched nature, which is only visible from the air. This kind of thing excites aviation fans and adventurous people as well. This helicopter flight in Mallorca will surely be an unforgettable experience! The helicopter pilots fly with you over the roofs of Palma, along the stunning cliffs in the west, the Sierra de Tramuntana, kilometre-long beaches, hidden coves, picturesque harbours, hidden mountain villages and undiscovered landscapes in the heart of the Balearic Island. Start from Palma and decide where you want to go on the island. Just tell the pilot what you have in mind and they'll fly you to the perfect places as chosen by you. A nice tour is the route along the west coast and over the harbour of Port d'Andratx to. On this flight in Mallorca, you can experience the fascinating combination of mountains and sea while flying over the western trains of the Tramuntana mountains with sea views throughout. Or pick to fly over the old town of Palma de Mallorca, the Balearic capital and go sightseeing without the stress. A special highlight is the flight over the mountain chain to the port of Soller in the north of the island. When crossing the mountains, you climb to unexpected heights and have a view of almost the whole island. This is a dream come true. In just an hour, you can do an awesome tour over the mountain range. The company has a professional pilot team and state-flight technique, which guarantee an unforgettable experience on the charter flight in the agile and comfortable helicopters. With many hours of flight experience, the pilots are experts in their field and know every corner of Mallorca which means that they show you the most spectacular destinations. Up to three guests can fly at once and the large panoramic windows ensure that everyone can get a good view of the island and its beauty. The top speed depends on the model but it's anywhere between 200-300 km/h and the maximum altitude is about 5000m. The slow and steady flight at a relatively low height makes a helicopter ride in Mallorca a one-of-a-kind experience. Be sure to get a fair few pics and videos from up in the sky in Mallorca. A helicopter flight over Mallorca is an extravagant thing to do but it is incredible and worth every penny. 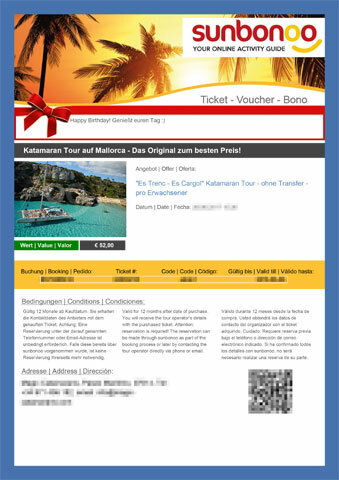 Make a loved one's dream come true in Mallorca. What a fantastic day. I will never forget that. Thanks to my dear darling for this great Christmas gift. I love you! was ein fantastischer Tag. Ich werde das nie vergessen. Danke an meinen lieben SChatz für dieses tolle Weihnachtsgeschenk. Ich liebe Dich! was a sensational flight with blue skies. Only with the weight you have to take. There were three and a weighed over 100 kg. As the helicopter needed more fuel, so we could fly instead of the planned 60 just 30 minutes. All in all, highly recommended. war ein sensationeller Flug bei schönstem Wetter. Nur mit dem GEwicht muss man aufpassen. Wir waren zu dritt und einer wog über 100 kg. Da brauchte der Heli mehr Benzin, so dass wir nur 30 Minuten, statt der geplanten 60 fliegen konnten. Alles in allem aber sehr empfehlenswert. The steep price is definitely worth the money. We enjoyed it very much, great Erlegbnis day of Liebe.Gerne once again. We know Mallorca long time, but from the air, the sight was spectacular! Der stolze Preis ist definitiv sein Geld wert. Wir haben es sehr genossen, tolles Erlegbnis am Tag der Liebe.Gerne einmal wieder. Wir kennen Mallorca schon lange, aber aus der Luft war der Anblick einfach spektakulär! Highly professional and well organized. This was definitely the most exciting and memorable part of our trip to Mallorca. The whole experience was just amazing from start to finish. An absolute dream !!! Absolut professionell und bestens organisiert. Dies war auf jeden Fall der aufregendste und unvergessliche Teil unserer Reise nach Mallorca. Die ganze Erfahrung war von Anfang bis Ende einfach unglaublich. You're reviewing: Hop in a helicopter and fly over Mallorca: See the sights from the sky. How do you rate this product?